The part SUM-941061 has an additional shipping charge of $9.99 per item due to its large size and/or weight. WARNING: Cancer and Reproductive Harm For more information, visit www.P65warnings.ca.gov. There are conflicting descriptions on this item. I purchase one 2 years ago and it is GREAT. The material is much better that the EZUP stuff and the legs are very sturdy. I am wondering if this is the same one Summit carried then. A picture of the frame and it fully erected would be great. 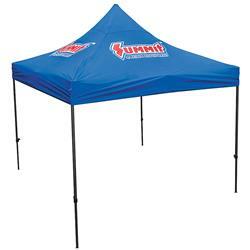 These are very similar to the canopies that Summit sold before. I own a couple I bought 3 years ago (after the white legged style) and recently purchased another one. It’s almost identical to the ones I bought 3 years ago. It has a gray hammertone frame, adjustable legs to raise the height, Velcro on the corners to hold the top in place, and a wheeled bag. The top seems to be slightly thicker than my older ones and I’m guessing the frame is made from steel as it’s too heavy to be aluminum. Hopefully these hold up as long as my others have. This is a very well built canopies. May cost more then a discount chain one which is not a well constructed and of course not a good looking. This is one of the, if not the best shade tent I have ever had. I will definitely be getting another one! Good quality. Very good canopy top. Good steal Frame. Just what I was looking for. Should have better stakes and rope to hold canopy down, but this is a minor issue. Overall would recommend this to anyone. Shelter Size: 10 ft. x 10 ft.
Other items you might be interested in.